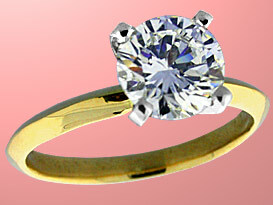 Lady's 18K Yellow Gold Tiffany & Co. 1.42ct Diamond Engagement Ring. All jewelry items are guaranteed to be as represented; including gemstone authenticity, weights, and precious metal content. Antiques, autos, art, and the like are also sold as per written description. Quantities are limited, some one-of-a-kind. Once it's gone, it's gone!! All jewelry purchases from this page are subject to a Comprehensive Money Back Guarantee (less shipping charges).